One of the earliest settlements established during the Spanish period was Las Piñas, a humble fishing village whose west border touched the Manila Bay. 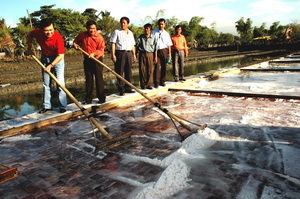 Salt-making technology using solar bed dryers was introduced in the 18th century. Clay tiles were used to line the salt beds to prevent the salt from coming into contact with the earthen ground. 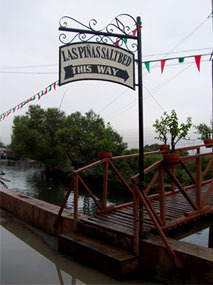 It allowed the salt produced to become white as snow and established the reputation of Las Piñas a a salt-making center well into the 20th century. The increasing population needed affordable housing, putting pressure to convert many of the salt beds into residential subdivisions. Pollution from industrial and domestic sewerage draining into Manila Bay destroyed the pristine waters which had been the salt industry’s primary ingredient. Rapid urbanization turned this once primary of source of livelihood into a memory. References: Crisanto, Joyce M. & Chit dela Torre. Las Piñas: A City with Heritage. Las Piñas City, Philippines: Villar SIPAG, 2006. Villar, Cynthia A. My Journey in the Las Piñas Arts & Crafts Industry. Las Piñas City: Villar SIPAG, 2008.